Bathtime is one of Elliot's favourite times of the day and I think it's important to find products that are kind on baby/toddler skin. Recently I spotted the Halo N Horns brand in Asda and I was immediately attracted by the funky and bright packaging. This product is part of their baby care range and like all their products, it features the cute Halos N Horns logo on really eye catching packaging. The thing I noticed was the smell - it smells AMAZING!! I can't put my finger on what it smells like but it's like a cross between something fruity and that fresh washing smell you get...mmm! We did notice that this baby bath isn't as bubbly as some other brands we've used but this is because it doesn't contain SLS - a foaming agent that can irritate the skin. I'm more than happy to take happier skin over a few bubbles anyday! Elliot's skin felt really smooth after his bath and it smelt lovely. He has got a small case of eczema on the back of his knees and some bubble baths do irritate it but actually after using this one, it wasn't as red as it normally is. The baby bath doesn't contain any ingredients that dry out skin so it can also be used as an all over body wash. I absolutely love this smell of this one, they weren't lying when they said it was zingy! It can be used as shampoo, or body wash and can even be poured under running water. Like the other products in the range, it is hypoallergenic and kind to eyes. 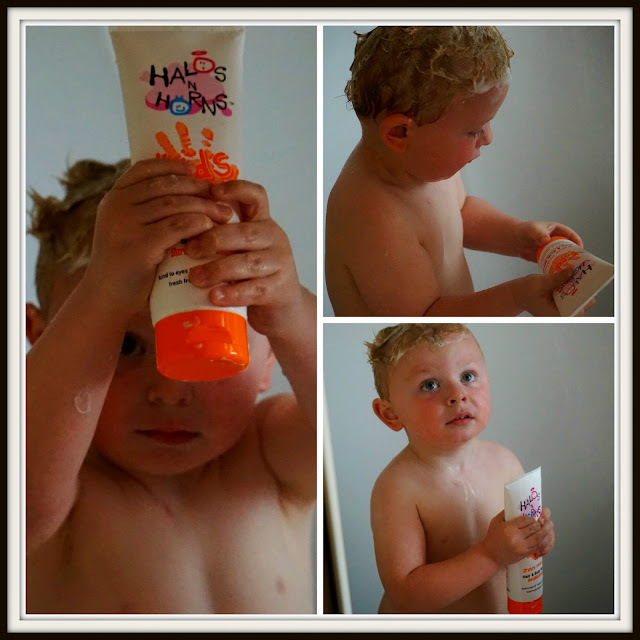 This is my favourite out of all the products as it's so multifunctional - we take a bottle when we go to Elliot's swimming class because it does hair and body and is light enough just to pop in the swimming bag. I also don't mind using it myself so saves taking a separate shower gel/shampoo for me! Much like the other products, this one smells gorgeous although I felt it was more apple than mango melon! It doesn't lather up lots but this is due to the ingredients not featuring SLS, the lathering agent found in most other shampoos that can irritate skin. You only need to use a small blob but I found it takes a bit of additional rinsing. Could be an issue if you wanted to get hair washing over very fast but not a problem for my little water baby who spends most of his time in the bath pouring water over his head! Elliot's hair smelt lovely after bathtime and was soft and shiny. Another reviewer suggested that using this shampoo & conditioner helps with cradle cap so I shall be interested in seeing if this is true. Elliot has had a bit of stubborn cradle cap for a while now and no other shampoos seem to get rid of it. But we will continue using this one and keep our fingers crossed! I really like this range and I'm sure we will purchasing again in the future. They all smell great, and are perfect for kids with sensitive skin. I might have to give these products a try, they sound brill! Such cute packaging. I think I remember seeing this on Dragon's Den years ago. I wonder if it is what I am thinking of.